Just recently I missed out on a set of genuine Mazda bonnet lifters on a certain auction site. I was a bit annoyed at this as they were going for a good price and I like to stick with Mazda parts wherever possible, sooo not wanting the chromey versions available elsewhere, I ended up sourcing some Mazda ones from a genuine parts dealer. My roadster deserves them and I felt like treating myself. After I'd placed the order online I had an email saying this part was out of production and difficult to get hold of and there would be a delay in processing my order. To their credit though Lifestyle Mazda Parts were able to track down a set for me from one of their suppliers and apologised for the delay. Other damper kits are available but if you want the genuine Mazda ones I suspect they may be tricky to find now! I also notice they no longer appear on LMP's website. So the reason for getting these is I was never really happy with the bendy stick used to prop open the bonnet. I'd previously bought a set of chrome lifters for my NB from FK Automotive but I never got around to fitting them before I sold the car on. This time will be different! These Mazda ones are less showy as they are plain black so should fit in nicely on a black car. They'll also help to show off the gram strategy bonnet after I remove that fabric insulation piece. 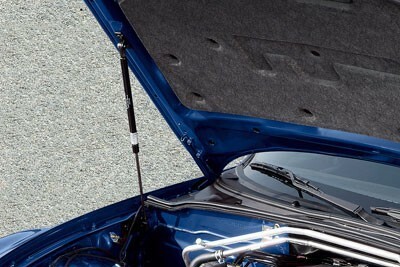 These parts are designed to mount quite close to the rear of the engine bay and are almost vertical when the bonnet is open, the advantage to this is you get maximum unimpeded access to the engine bay. Other designs mount lower down on the bonnet but sit across the front wings and potentially get in the way of tinkering. The mounting hardware on these are all in black finish and look nice and robust, you also get a comprehensive 9 page instruction booklet. Here's a couple of photos I took after opening the box.